Does your Bel Air Home lack Privacy? Install a Privacy Fence! Bel Air, Maryland is a great place to live. And with a population growth of over 5% since 2000, it looks like lots of people are starting to realize the many benefits Bel Air has to offer. As the city continues to grow, privacy may be harder and harder to come by. Sound familiar? Maybe it’s time to fight back! Privacy, duh! These fences are a great way to keep your nosey neighbors at bay so you can enjoy uninterrupted time with your friends and family. These fences also provide excellent Curb Appeal. There is just something about a privacy fence that really sets a home apart from the crowd. A privacy fence is equal parts functionality and aesthetic appeal. 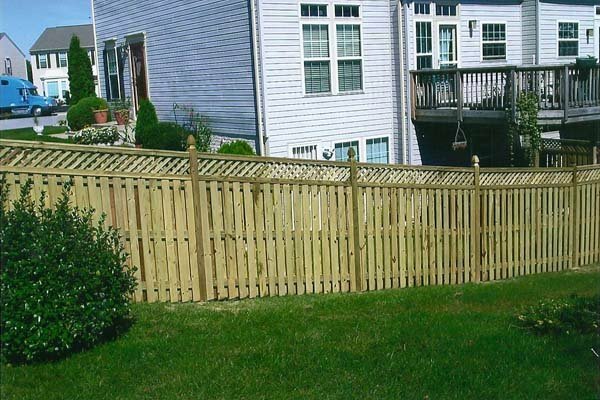 A privacy fence is a great way to add extra Security and Safety to your home. These fences are not only deterrents to would-be burglars, they are also great for pet owners and parents, giving your little ones a care-free place to play. Because of their sheer size, these fences help with Noise Pollution. This is great if you live near a busy roadway. These fences come in a Wide Variety of styles and materials. Do you prefer vinyl or wood? The choice is yours. And don’t get us started on styles. There are too many options to try and explain here! With 40 years of experience, Freedom Fence and Home provides the highest quality fence installations in the area. Our fencing experts are available to help homeowners and business owners select the right design and materials for their fencing project. We are licensed and insured in the state of Maryland and our record of zero complaints with the Maryland Home improvement commission and the better business bureau speaks for itself. If you have any questions about the benefits of adding a Privacy Fence to your Bel Air home, please contact Freedom Fence and Home by calling 443-271-6841 or visit our website. You can also follow us on Facebook and Twitter! This entry was posted on Tuesday, July 29th, 2014	at 5:07 pm	. Both comments and pings are currently closed.